Paintings in natural wax can have such intriguing subtlety. But it will be our secret how simple and fun it is to create these effects! If you would like to try creating a painting in wax that includes a bit of drawing (or “mark-making”), and also adding color, this is the class for you. You’ll explore simple techniques that result in amazing effects. Tracy will show you how to create a base layer of wax on panel, then will demo all kinds of fun ways to make marks in the wax. You will love the variety of tools she brings to share with you! But that is not all…you will also get to tint the textures you have created with oil colors. As a final touch, try some mica powders to highlight the interesting textures you have created. 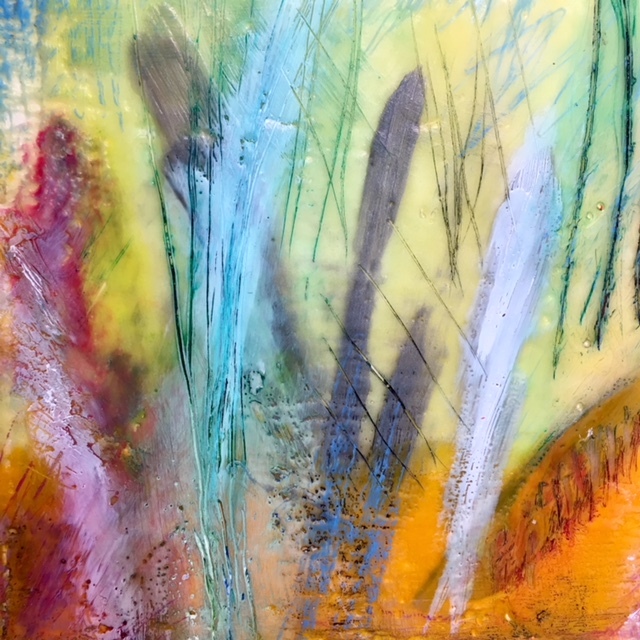 As with all of Tracy’s “Renegade Encaustic” classes, you will leave with a very cool painting to keep and enjoy. Try both Encaustic Wax Medium and Beeswax. Highlight texture using mica powders as a final touch.